Direct Sportslink secured Coach Butch Jones as the keynote speaker for The Tennessee Chamber of Commerce's 103rd annual event. 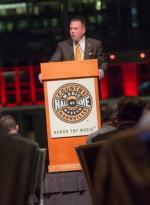 This highly anticpated event included the Governor of Tennessee, local Tennesse business executives and civic leaders. Coach Jones spoke about a number of topics and was very well received. Please see the testimonial below. Additionally, Coach Jones participated in a private VIP meet and greet with photos and autographs. To secure Coach Buch Jones for your next keynote speaking engagement appearance please contact a Direct Sportslink booking agent for an immediate quote and availability. 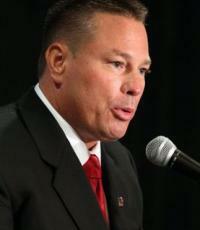 "A big thanks to Direct Sportslink for helping us secure Butch Jones for our annual event. You made this an easy process and were there for us from the moment we secured Coach Jones until the end of our event. He was an excellent speaker, great with the guests during the meet and greet, and signed all of our items. The event was a huge success." A Butch Jones personal appearance, Butch Jones speaking engagement, or Butch Jones endorsement will reflect well on your company. To hire Butch Jones now for any corporate appearance, fundraiser, motivational speaker event, personal appearance, autograph signing, or website endorsement please contact our celebrity agents at 1-877-6-SPORTS. We will contact Butch Jones or contact Butch Jones' agent and provide you with the booking fees and availability immediately upon your request. Direct Sportslink is the only sports speakers bureau and talent booking agency based in the United States securing only sports talent for corporations, associations, and organizations for motivational speaking engagements, personal appearances, and endorsements. We are the premier sports celebrity booking agency and a sports celebrity procurement expert. Accordingly, we will provide you with any relevant Butch Jones website information and booking agent details so that you can hire Butch Jones for your next event. 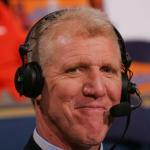 After graduating, Jones earned a job as a defensive assistant at Rutgers University right out of college in 1990. Two years later, he took a job as offensive coordinator at Wilkes University, helping to guide the team deep into the Division III playoffs. In 1995, he returned to his alma mater, Ferris State to serve in the offensive coordinator role. His offensive acumen was clear as he led Ferris State to the top-ranked offense nationally for three straight years. He arrived at Central Michigan in 1998, coaching tight ends for one year, running backs for two more, and finally called the plays on offense from 2002 to 2004. He left the school in 2005 to coach wide receivers at West Virginia University, helping to lead the school to back-to-back top ten seasons. Jones returned to Central Michigan as head coach in 2007. In his first year he posted an 8-5 overall record and a 7–1 conference record. He guided CMU to the MAC title at Ford Field in Detroit against Miami (Ohio), and led the team to its second consecutive Motor City Bowl. He was only the ninth football coach in Mid-American Conference history to win the championship in his first season. In 2009 he guided the Chippewas to their third MAC Championship in four years after an 8–0 MAC schedule, the first time in school history the Chippewas went undefeated in the MAC. CMU completed its run with a 20–10 win against Ohio in the MAC title game at Ford Field. He left CMU with a 27–13 overall record and 20-3 MAC record. 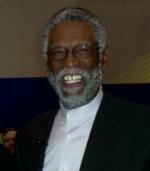 On December 16, 2009, Jones was named head coach at the University of Cincinnati. He led Cincinnati to a 2011 Liberty Bowl win. On December 7, 2012, Jones was introduced as the new head coach of the Tennessee Volunteers, replacing coach Derek Dooley. Based on your interest in Butch Jones as a speaker or for a personal appearance, Direct Sportslink has provided you additional links below for other sports talent with similar appearance fees, speaker topics, and categories that match Butch Jones.